Until the Quiet Comes‘ weakness lay in its too-languorous downtempo, but You’re Dead! returns to the sonic frisson of his earlier work. It opens with “Theme” and the droning sound of gongs and chimes to unsettle its ghosts, then leaps into the mathematical, stop-start tempos of jazz fusion, with august acts like Weather Report and Return to Forever as guideposts. There is a cameo by Herbie Hancock, who revisits the glissando piano keyboards of his ’70s recordings like Man-Child on “Tesla,” as well as post-millennial fusion musicians like bassist Steven “Thundercat” Bruner and drummer Ronald Bruner, Jr. Appearances by Niki Randa of Blank Blue, pianist and composer Miguel-Atwood Ferguson and vocalist Laura Darlington of the Long Lost link the project to an L.A. underground that has fused a multitude of genres, from hip-hop and electronics to jazz and folk music, into a psychedelic constellation since the early 2000s. Part of the fun of You’re Dead! 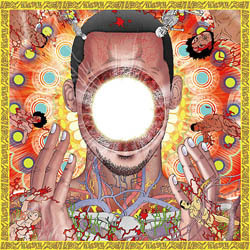 is how Flying Lotus pulls disparate elements into this sunshine underground. Kendrick Lamar teeters between lyrical freak-out and emotive harmonizing on “Never Can Catch Me.” Snoop Dogg continues his surprising post-Snoop Lion comeback with “Dead Man’s Tetris,” a sluggish bit of videogame funk where dead homies bounce on astral planes with Freddie Mercury. Flying Lotus’s usual tics — the 8-bit flurries, the Millennium Falcon laser blasts — are specked throughout. The 38-minute album eventually settles into a meditation on death, alternating between individual demises like Captain Murphy’s (aka FlyLo) addled approximation of a drug overdose on “The Boys Who Died in Their Sleep,” and philosophical musings like the orchestral soul of “Coronus, the Terminator” and “Your Potential//The Beyond.” These numbers lean toward the kind of passivity that subdued Until the Quiet Comes. But the memory of Flying Lotus’s frenetic opening lingers and imbues the rest with purpose. While it begins with an exclamation point, You’re Dead! ultimately wonders what happens to our souls after we die, and imagines a journey that continues long after our untimely demises.